I’m doing pretty well picking-up proofs of books at the moment. Last week I picked up a copy of Lollipop Lounge: Memoirs of a Rock and Roll Refugee by the great Genya Ravan, which is a rollicking real life romp. For those that don’t know Genya was one of the true pop pioneers, and maybe better known as the Goldie of Goldie and the Gingerbreads ­ arguably the first all-girl r’n’b group. The book tells the story of Genyusha Zelkowitz, her family’s escape to New York as Holocaust survivors, the matamorphosis into Goldie, her creation of a punky all-girl gang, their passage through the ‘60s, and her subsequent solo career as Genya Ravan, her productions (including the Dead Boys and Ronnie Spector), and her all-consuming battles with demons and dangers. It’s one hell of a book. I first came across Goldie and the Gingerbreads on a compilation called Girls With Guitars, which came out around 1989 on the Ace subsidiary Impact. It was put together by ‘60s Girls Scholar Mick Patrick, and featured a couple of Goldie and the girls’ recordings, produced by Alan Price and Shel Talmy respectively. 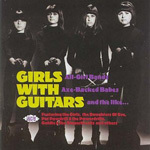 Other Goldie tracks have surfaced on Ace CDs in the Where The Girls Are series and the recent Girls With Guitars collection, which confusingly bears no similarity to the 1989 vinyl edition, but instead features four songs the girls recorded for the Scepter stable. It also features a couple of tracks by the CD’s cover stars The Girls which are glorious, and as sisters I suppose it could be argued they pre-dated ESG, possibly the all-time greatest femme outfit. Perhaps best of all Goldie’s recording of 'Headlines' for Immediate is featured on the recent Mod Box Set. She had then temporarily lost her Gingerbreads and was touring with Jimmy James and the Vagabonds backing her, then returning the favour on their New Religion set. So somewhere along the line Goldie would have come across Pete Meaden, and there’s a thought to conjure with. Mick Patrick was editor of the fan/magazine That Will Never Happen Again, and the legendary ‘60s Brit Girls edition was invaluable for pointing a new generation in the direction of that then criminally neglected genre, and lost 45s and LPs by the likes of Samantha Jones, Billie Davis, Kiki Dee, Tammy St John, PP Arnold, Madeline Bell, The Orchids and many more. These recordings were often British reinterpretations of US soul/r’n’b ones, and so of no interest to purists at the time. Later the Northern Soul scene picked up on the more uptempo excursions, but it was really many years more before the British girls’ back pages got the credit they deserved. Now, naturally, the salvage industry being what it is, we are almost spoilt for choice. The RPM Dreambabes series has been a real delight, and the most recent Sassy and Stonefree set is highly recommended ­ particularly for the Val McKenna tracks, which are gloriously soulful. There seems a very strong case for a compilation of her various ‘60s recordings, just as there is for a proper overview of Kiki Dee’s soultripping. Another essential set is the recently rereleased The Girls’ Scene from Deram, which plunders the Decca archives and salvages some of the songs from that aforementioned Girls With Guitars set, like Dana Gillespie, The Orchids, and the Mysteries. It also features Billie Davis’ 'Nobody’s Home To Go Home To', which is one of the best things ever. One valuable lesson in life is to buy any late-‘60s recording by Billie. - and if you can find a photo from the same era, all the better. The Girls’ Scene is part of a terrific series of sets from the Decca archives. The Mod, Northern Soul, and Freakbeat sets are highly recommended too, and credit must go to arch mod Phil Smee for making the CDs look so cool. There’s some really wonderful stuff captured here, from The Attack and Poets through to Samantha Jones and Adrienne Poster, from Timebox and Amen Corner to Elkie Brooks and the Eyes of Blue. And as everybody always says the Northern Soul set features David Essex and the Brotherhood of man, and spectacularly gets away with it. One other CD to point you in the direction of is Girls Don’t Come, which is the tenth and final volume in the Here Come The Girls series. It’s a perfect place to start if you’re interested in ‘60s Brit Girls, and features absolute classics by Val McKenna, Sharon Tandy, Barbara Ruskin (whose immortal 'Euston Station' is featured in the latest Virgin Trains on-board newletter), Sandra Barry (who once had The Action backing her), Maxine Nightingale, and Peanut who went on to be Katie Kissoon, and as such sang with Dexys. If you can find a cheap copy, it’s a real must have. Also featured on the CD are Pickettywitch with Polly Brown on vocals, which is taking the Brit Girl thing into the early ‘70s when the group were purveyors of bubbling blue-eyed bubblegum soul, along with Joe Strummer’s-soft-spots Middle of The Road of 'Chirpy Chirpy Cheep Cheep' fame. The other side of the coin was the development of the singer-songwriter best demonstrated by Lesley Duncan, who should have been as massive as Carole King. Her two early-‘70s sets, Sing Children Sing and Earth Mother, are available through Edsel and are absolutely essential, though Lesley’s smiles on the covers could hijack your hearts. Lesley, like Kiki Dee and Madeline Bell, sang backing vocals on numerous UK r’n’b responses during the ‘60s, like Goldie herself, very much carrying a flame for pioneering black music. Which is what worries me slightly. It’s terribly tempting to lose oneself in the back catologue of Billie Davis and Dusty, but those girls themselves today would rather be absorbing, say, Amerie’s go-go beats or the loveliness of a Teedra Moses ballad, and living the life of grime or reaching the desi heights where new ground is being covered, fresh femme battles fought, and awesome pop created. Yet it’s still worth mentioning Revola are at last releasing Chuck and Mary Perrin’s Life Is A Stream, and for that I am at least truly grateful.